All species of squash and pumpkin are native to South and Central America. 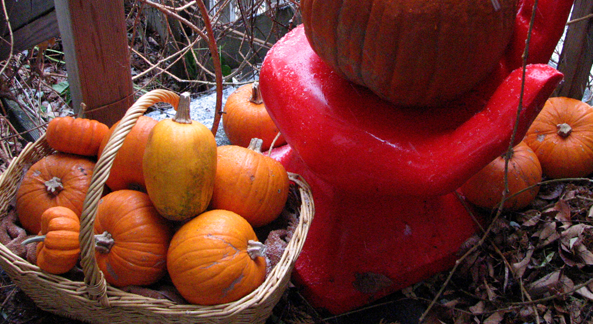 The sugar pie pumpkin is different from the American jack o’lantern pumpkin. The sugar pie has a thicker deeper-colored flesh with a tight smaller seed pocket. Its taste is sweeter and texture firmer. The jack o’lantern is usually bigger and is not usually used for eating or in pie, but is carved at Halloween. Spread clean dry pumpkin seeds on a baking sheet. Sprinkle with seasonings and oil. Mix to distribute. Spread in a single layer. Bake in an oven at 325 for 15 minutes or until golden brown. Check every few minutes and stir while baking. Pumpkin seeds can also be roasted in a large, heavy frying pan over medium heat on top of the stove. They burn easily and must be stirred constantly. Sauté the onion in a large fry pan over medium-high heat. Sauté onion in olive oil for 2 minutes until transluscent. Add the garlic and stir. Add the pumpkin cubes and gently mix. Cook 2 more minutes. Season to taste with salt and pepper. Although pie pumpkins can be cooked and eaten like squash, their most common use is for pie filling, cakes, cookies and quick breads. 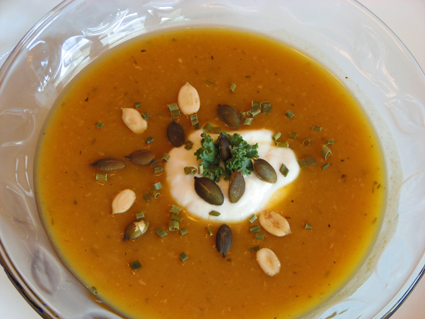 Sugar pie pumpkins lead all fruits and vegetables in their vitamin A content, so use them in soups as much as possible. Pumpkin seeds are an excellent source of protein and fat. Don’t store pumpkins in the refrigerator. They will keep for about two weeks at room temperature and longer in an environment of 40-45 degrees F.
Heat butter in a large heavy pan. Add the onion and saute until tender. Add 1 cup water, cover pan and simmer 15 minutes. Blend until smooth and return to pan. Add remaining ingredients, except for cream and milk. Continue to cook over very low heat for 10 minutes, stirring occasionally. Add dairy products just before serving. Can be served topped with sour cream and chives. Cook pumpkin in butter in a large pan over medium high heat. Add 1/4 cup water and carrots. Cover and simmer until pumpkin is tender. Remove bay leaf and discard. Add remaining ingredients except for wine. Blend until smooth., simmer 10 minutes more on low. Remove from heat, stir in wine. Serve topped with chopped parsley. Over medium high heat in a large pot, saute the onions in olive oil for a minute. Add the garlic, pumpkin, potatoes and beans. Saute for three more minutes. Add all the seasonings, bring liquid to a boil and then turn down to a slow simmer. Cover and cook for 1/2 hour, stirring occasionally. Remove the bay leaves. Using a stick blender, puree to a smooth texture. This soup can also be made by putting everything into a slow cooker. Cook five hours on high or eight hours on low. 1/4 pound of dehydrated pumpkin can be substituted, increase water by 2 cups. A 2 lb. Pumpkin will make about a pound of pumpkin cubes. Preheat oven to 350 degrees. Grease a 9 x 9 baking pan and dust lightly with cornmeal. In a blender or food processor, combine dates and oats. Blend until finely ground. Add honey, oil, eggs, orange peel, and orange juice concentrate. Blend until smooth. In a large bowl, combine rye flour, baking soda, baking powder, spice, and salt. Mix well. Gently fold together the wet and dry ingredients. Add apples, currents, and nuts. Do not over-mix. Pour into prepared pan and bake for 40 minutes. 1. Steam 2 cups of pumpkin until tender. Either (a) microwave for about 10 minutes (depending on the wattage of the oven, or (b) cook on top of the stove in a covered pot. Use a french steamer basket over 1 cup of water. Simmer for about 20 minutes. 2. 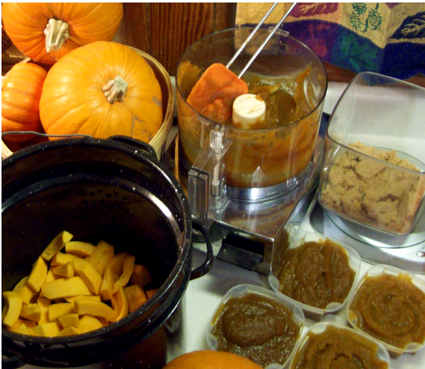 Place the cooked pumpkin in blender and combine with 1/2 cup brown sugar and 1/2 to 1 teaspoon of pumpkin pie spice. Adjust spice and sugar to your taste. This will keep for several days in the refrigerator. For longer storage, freeze in ice cube trays and then place the cubes in a freezer bag. As you need them, thaw overnight in the refrigerator or in the microwave. This recipe works best with a bamboo steamer placed over a large pot, but can be made with other equipment. In a large pot or wok over medium high heat, cook the onions and celery in the olive oil until translucent (a minute or two). Add the garlic, cook about a minute and then add the stock and dried vegetables. Bring to a simmering boil. Beat the pumpkin, ricotta cheese and eggs in a large bowl with an electric mixer. In a large mixing bowl, combine pancake mix, bread crumbs, Parmesan cheese, and salt. With a rubber spatula, folding gently, combine the flour mixture with the pumpkin mixture. 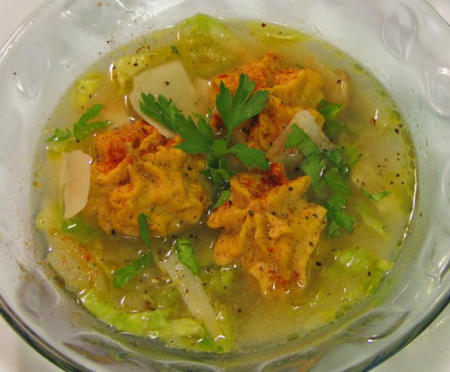 Using two spoons or a piping bag, drop small mounds of the batter into a steamer basket which has been lined with cabbage leaves. Place the steamer basket over the boiling stock and cook for 15 to 20 minutes. To check to see if the dumplings are done, carefully remove one with a spoon and break in half. The inside should be soft but not doughy. The texture is just a bit firmer than pumpkin pie. Remember everything is hot so use caution when tasting, testing and removing the dumplings. Roll up the cooked cabbage leaves and cut into very fine shreds. Check the stock to see if it needs salt or pepper to suit your taste. If you used water, you may want to add some powdered soup base or instant bouillon to the liquid. For each serving, place some shreds of cabbage in a soup bowl. Ladle some of the simmering stock into bowl. Place dumplings in the center and sprinkle with parsley, cheese, a fresh grinding of black pepper, and a bit of paprika for color. If you like more spice, try smoked paprika, chili powder, chipotle, or cayenne pepper. Green or Red Tabasco sauce is a good condiment to pass around the table. In a large pan or wok, combine the cider and the mulling spices, setting aside 2 ½ cups for the sauce. Bring to a boil. Beat together the pumpkin, ricotta cheese, honey and eggs, using an electric mixer. In a large mixing bowl, blend the pancake mix, bread crumbs, salt, and spice. Combine the two mixtures gently using a rubber spatula. With two spoons or a piping bag, drop small mounds of the batter into a steamer basket which has been lined with lettuce leaves or parchment paper. The dumplings should not touch each other. Place the steamer basket over the boiling cider and cook for 20 minutes. While the dumplings are steaming, make the sauce. For the pomegranate sauce, place 2 1/2 cups of cider, 2 tablespoons of honey, and 1/4 cup of pomegranate seeds in a large pan. Boil for 10 minutes or until reduced and syrupy. Lift out the seeds and discard. Or you can make the cranberry sauce by placing 2 1/2 cups of cider and 1/4 cup of sweetened dried cranberries in a large pan. Boil for 10 minutes until reduced. For either sauce, a tablespoon of brandy can be: 1.) omitted, 2.) added at the beginning for a mild taste, or 3.) added at the end for a stronger taste. Once thickened, remove the sauce from the heat and allow to cool. When the dumplings are done cooking, dip each one in the sauce to coat them. For each serving, place some cream in a dessert dish, either straight out of the container or whipped. 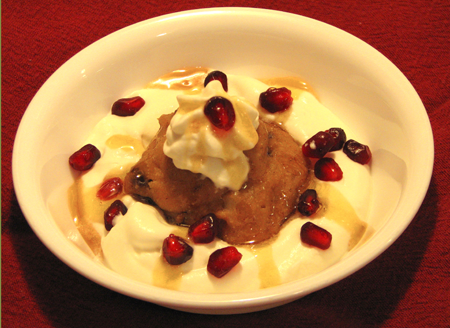 Place a dumpling in the center, sprinkle with pomegranate seeds and pour some sauce over the top. For the cranberry sauce, spoon it over the top and serve. These can be varied in many ways. Try a few tablespoons of dried fruit or nuts in the batter before they are steamed. Chopped figs and chestnuts are a delicious option. So are raisins, dried apples, dried mincemeat, walnuts or pecans. Eat them drizzled with honey or plain, just as they are, with no cream or sauce. 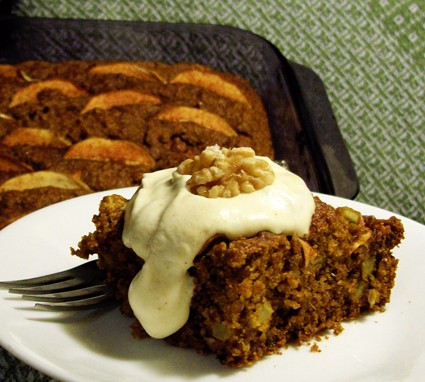 They are great hot with vanilla or eggnog ice cream topped with nuts. Strain the cider and serve in mugs either straight or with a splash of spirits such as brandy, rum, or grenadine (drop in a few pomegranate seeds for color). Preheat the oven to 350. Grease a 10 x 15 inch jelly roll pan. Beat the oil, eggs, sugar, and pumpkin with an electric beater, or in a food processor, until smooth and well blended. Sift together the flour, spice, salt, and baking powder. Mix the wet and dry ingredients together. Pour the batter into the prepared pan and place the pecans on top so that each finished bar will have a nut in the center. Bake for 25 minutes. Meanwhile, heat the butter, rum, and honey in a small sauce pan until it bubbles. Simmer over low heat for an extra minute or two if you want to reduce the alcohol in the glaze. 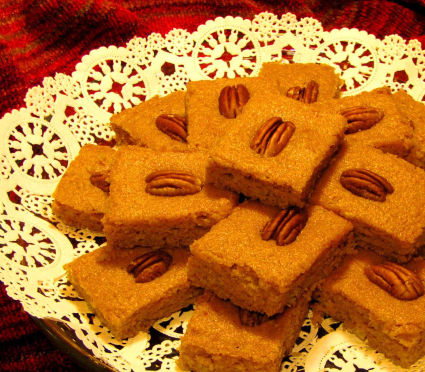 When the bars are done, gently brush the pecans with the butter-rum mixture. Allow to cool completely before cutting into bars. Refrigerate or freeze the bars in air tight containers. Here's a recipe without the hassle of making a crust because it bakes right in it's own shell. You cut out a lot of fat and calories with out a pastry crust so it's better for you. Kids love to do this with the pumpkins that they grow in their own garden. If the pumpkin has a stem, remove it. Wedge the tip of a knife just under the stem and pry upwards. It should pop off easily. Pretend the pumpkin is a globe with the stem end being the the north pole. Cut it through the equator into two equal hemispheres. Remove the seeds and stringy membrane. Place each half in an oven safe bowl. Cover loosely with foil or an oven proof small plate. Bake at 350 degrees for about an hour until the flesh is soft. Remove the pumpkin from the oven and allow to cool. If you wish to bake the custard later, just cover and refrigerate. 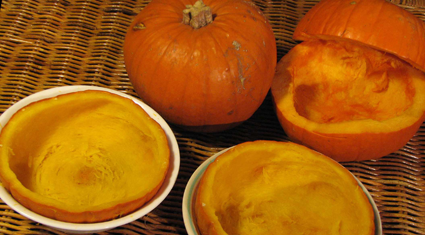 Using a melon baller or a large spoon, scoop out the inside of the pumpkin to leave a pumpkin shell. Measure the pumpkin flesh either by weight or volume. If you have one pound (1 cup) of pumpkin use the ingredients listed. If you have two pounds (2 cups), double the milk, brown sugar, maple syrup, eggs, salt, and spices. For those on sugar restricted diets, replace the brown sugar and maple syrup with a brown sugar substitute, according to package directions. Place the pumpkin along with the rest of the ingredients in a blender or food processor, or beat with an electric mixer until smooth. Pour into the pumpkin shells, return to the oven and bake for 45 minutes. 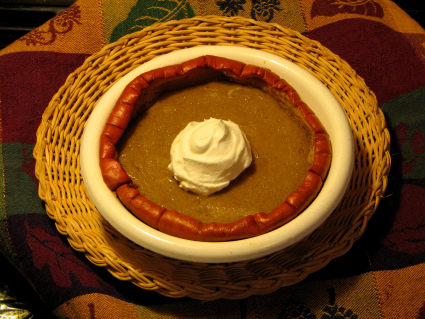 Follow directions as for baked pumpkin pie custard. *Found in health food stores.